> JumpCloud > Using Gmail? Still Have Active Directory®? Learn How to Move Your User Directory to the Cloud. Active Directory has been core to controlling user access to an organization's network for decades. 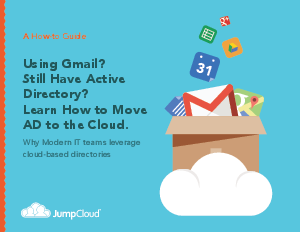 But economics and the proliferation of device types are causing a mass shift from Microsoft Active Directory and Exchange to cloud-based solutions like gmail. As companies move to Gmail en masse, they are struggling with their user directory. Download this guide to learn how innovative organizations are moving their directory to the cloud. This guide outlines how moving to a Directory-as-a-Service will provide tighter security, reduce expenses, and increase agility for your organization. Don't let this fundamental shift in the technology marketplace pass you by. Get the tools you need to keep up with this quickly changing landscape.